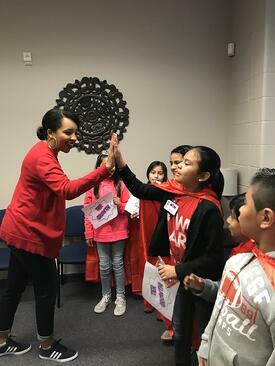 Today we highlight a winner of the 2018 Istation Red Cape Moment Contest. We are proud to announce Central Elementary School in Lewisville, Texas, as our first winner! from Istation Reading. Central’s students are encouraged to track their reading growth in a few different ways. Students in grades K-2 track growth by coloring in a bar graph each month, while students in grades 3-5 use a line graph to plot a point for their Istation score each month. Photo to the right: Lea Devers, principal at Central, high fives students for showing Istation growth. The campus doesn’t just celebrate the highest scores in the classroom but any amount of growth made during the month. 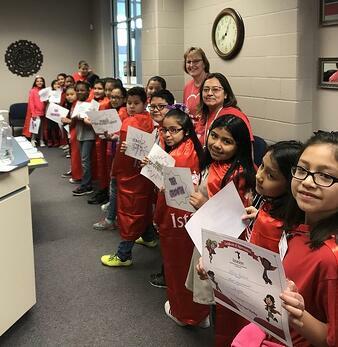 The 4th grade educators at Central purchased a few of Istation’s red capes and give them to the students who progress the most each month. The students receive a special lunch and parade through the school’s halls wearing their red capes. Principal Devers tweets a photo of students showing their pride and excitement. The school has a data wall which uses five colors to represent students’ overall reading ability. Teachers work together every month to track students’ reading success and display it on the campus data wall. They use every source of data to triangulate where each student falls in the various reading levels. To identify the reading level of each student, they combine their classroom observations with data from Istation Reading, DRA/EDL assessments, and current running records measured during guided reading. 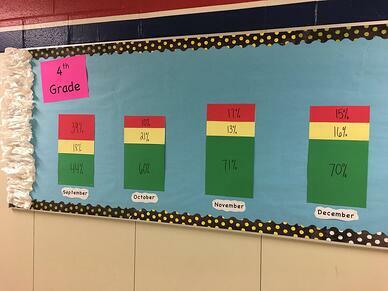 Fourth grade teachers display Istation tier results each month. Henderson describes the data wall as an invaluable tool that helps teachers determine which students are in need of intervention and which students would benefit from enrichment opportunities. Lindsay Henderson shows a collaboration meeting among 4th grade teachers. Reading data check-in meetings between principals and teachers also take place monthly. These check-ins create space and time to reflect on practices and utilize one another’s experience to brainstorm next steps. 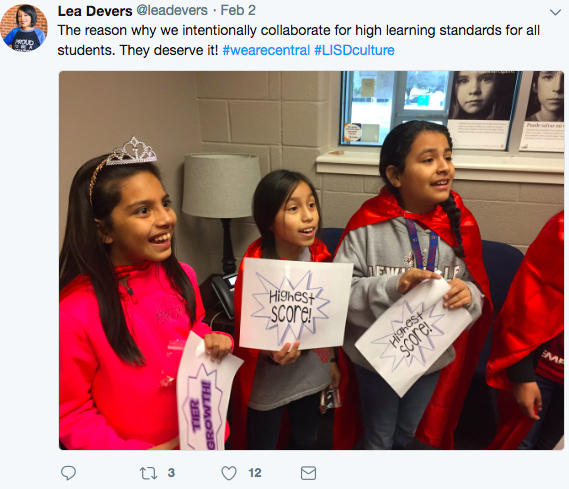 Administrators are able to ask for feedback and inquire how instructional leaders can better support teachers as they try to move to the next steps. After reviewing goals with students, teachers help them plan a strategy for accomplishing each goal they have set. Istation data helps teachers at Central group students by tier level. The whole campus is dedicated to finding additional instruction time to deliver interventions. 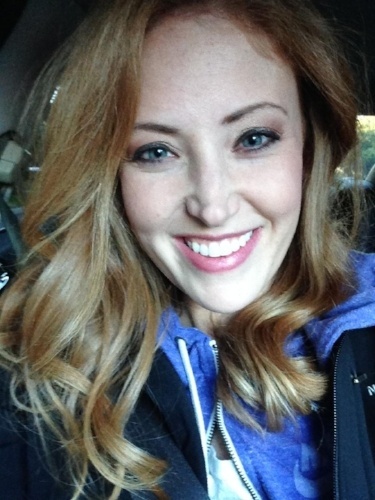 Photo above: Lindsay Henderson tweets about one teacher’s small-group time with students. 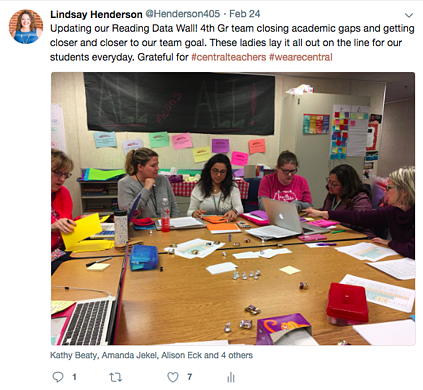 “Together, teams collaboratively brainstormed instruction strategies, literacy station ideas, and next steps based on what the data revealed,” Henderson said. 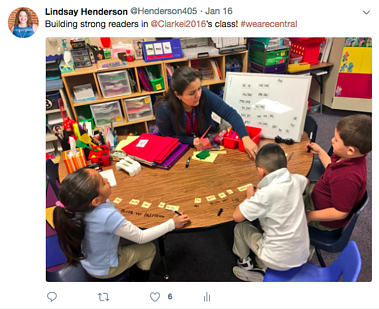 Classroom teachers at Central have found Istation reports are a reliable tool to help diagnose students’ reading challenges and aid in planning next steps. Teacher directed lessons (TDLs) are available alongside each student or classroom report to provide the teacher with additional instructional material. Central Elementary students smile with their Istation capes and certificates. Central Elementary is dedicated to developing a deep appreciation for learning among students. Istation’s accurate data shows Henderson that her teachers and students are beating their previous year’s scores — benchmark scores are 12-15 percent higher! Check out this amazing video the school put together to celebrate student growth! Tune in next week to hear about the other contest winners!